In December 1810 the townships of Windsor, Richmond, Wilberforce, Pitt Town and Castlereagh were proclaimed at a dinner given by the then Governor of NSW Lachlan Macquarie. 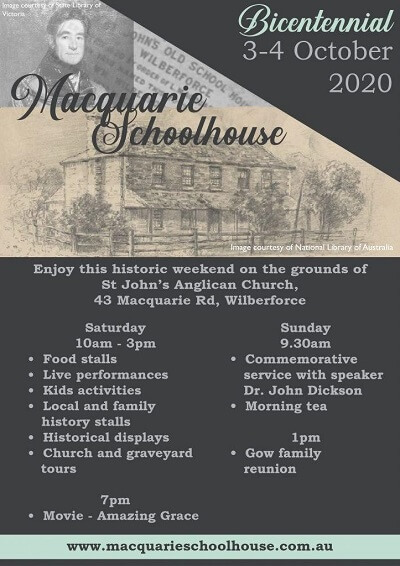 The town of Wilberforce was named in honour of William Wilberforce, an English politician and humanitarian whom Macquarie admired. Five weeks later the surveyor James Meehan marked out the principal streets, town square and burial ground for Wilberforce. The name of the town was painted on a large board and nailed to a post. In keeping with sensibilities of the time, Governor Macquarie felt that even in remote areas, settlers should observe the established practices of Christian burial. In May 1811 Macquarie directed that burials were to take place within the designated burial grounds and not on settler’s farms as was common practice. The burial grounds had been ‘lately consecrated by the Principal Chaplain of the colony, Reverend Samuel Marsden. Macquarie ordered that the district constable be informed and that the nearest chaplain attend to the interment in a ‘decent and becoming manner’. Despite this regulation, burials did occasionally occur at the place of death. The burial register of St Matthew’s Church of England, Windsor, reported that bodies dredged from the river were often in an advanced state of putrefaction which necessitated the corpses being buried on the spot. Settlers who died on their farms several days journey from a designated burial ground continued to be buried on their properties. As there was no separate register for Wilberforce Cemetery at the time of its consecration, burials were recorded in the register of St Matthew’s Church of England, Windsor, the first being recorded in December 1811. The first burial recorded in the register for Wilberforce was that of David Brown who was buried on the 10 January 1826. Burials have been recorded in the register held at St John’s Church of England, Wilberforce since that time. A schoolhouse was built by Macquarie adjacent to the cemetery in 1819 and is the only surviving example of a Macquarie era schoolhouse. St John’s Church of England was completed in 1858 from funds raised by local subscription. Although Wilberforce Cemetery was originally consecrated by the Church of England in 1811, the burial ground has also been used as a general cemetery since 1906 and includes persons of another, or no religious denomination. For example, in 1979 an unknown male body removed from the Hawkesbury River by police was interred at Wilberforce. The cemetery was administered by trustees until 27 February 1968 when responsibility was handed over to Colo Shire Council in accordance with the Local Government (Control of Cemeteries) Amendment Act, 1966. The trustees of the cemetery had been responsible for maintenance and fencing of the cemetery. For example, in May 1924 the trustees resolved to purchase a ‘key and padlock’ for the burial ground gates. A photograph from the collection of the Mitchell Library taken about 1912 shows the post and rail fence in the middle distance. The cash book reconciliation for 1875-1876 for the Trustees of St John’s Church revealed that a Mr Hayes was paid £8-9-9 for the erection of a fence around the cemetery. Evidence remains of this fence along the Old Sackville Road alignment of the site. In 1938 the maintenance was carried out by day labour as part of a government unemployment relief scheme, while in 1939 Mr Oliver Turnbull was engaged to ‘chip paths etc’. In April 1977 the Colo Shire Engineer Mr Owen Earle, commented on the generally confused state of the cemetery. A plan for the cemetery with new plots and new row numbers was drawn up by Council and Mr Earle recommended that a new register be commenced for the new sections and a similar register be drawn up for the existing sections. Council’s intention was to further develop new plots for the cemetery and undertake a landscaping project. The plans were only partially carried out including two columbaria. The register for the new sections and several plans are held by Hawkesbury City Council, Windsor. 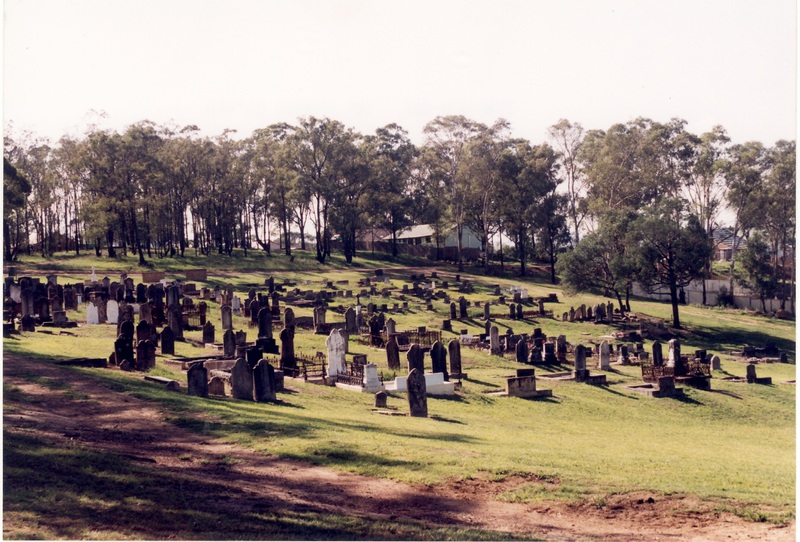 In 1981 Colo Shire Council amalgamated with Windsor Municipal Council and the newly formed body, Hawkesbury Shire Council took over management of the cemetery. Hawkesbury attained city status in 1989 and the local government entity is now known as Hawkesbury City Council. The Council is responsible for the maintenance of the grounds and for the overseeing of conservation works. In recent years several graves have been restored by descendants of pioneer families. Persons with existing burial rights may still be interred at Wilberforce with occasional burials still taking place. Hawkesbury City Council has fenced the cemetery and undertaken a conservation plan to ensure that Wilberforce Cemetery remains as a visible legacy of the rich settlement history and heritage of the district. Reference: Transcribed by Cathy McHardy and Nicholas McHardy in 2003. You are welcome to add a comment, provide further information or suggest a correction, relevant to the history of this name. Unfortunately there was an error in submitting your comment. We require a valid email address. Please check your details and try again. Hawkesbury People and Places is an ongoing project which collects & locates places, buildings, organisations and people of the Hawkesbury Region.